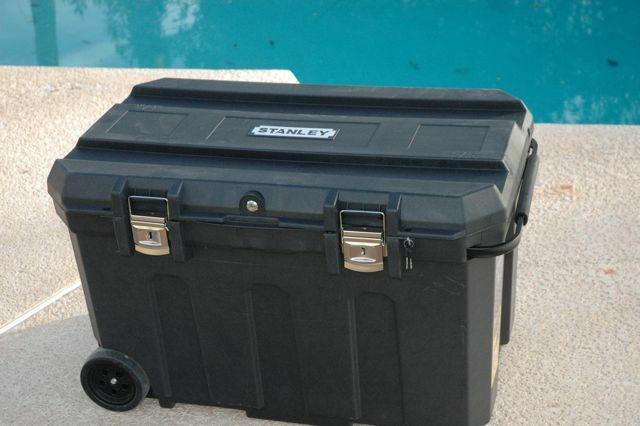 If the thought of a $500+ case to transport your CPC1100 is just a little too much to bear, take a look at the Stanley ProMobile Job Chest from Home Depot. It's $60 US and fits the CPC 1100 exactly. The case is made of high-strength resin - so strong you can stand on it without bending it -- and it comes with a locking lid and two extra holes for your own additional locks! It also features two strong wheels and a retractable handle. Inside, there's room for about 2" of foam in all directions to protect your scope from rattles and bumps. It's 37 7/8 X 22 3/4 X 23 1/4". Take a look at www.stanleyworks.com and save a ton of money on the "alternative"! Thanks! 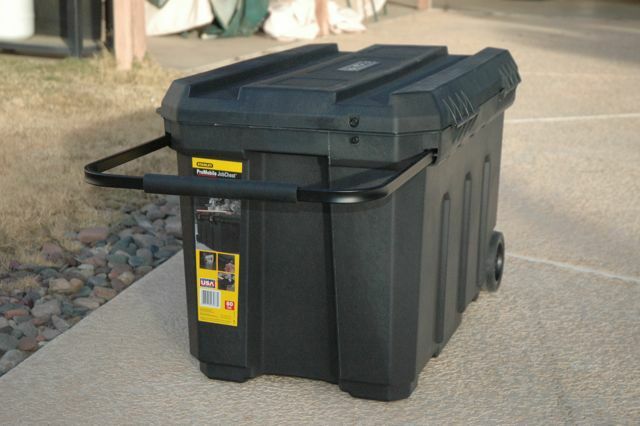 I was actually thinking of building a wheeled plywood box, and this is far better. It's twice as much on Amazon. Guess I better grab one before HD realizes! CAn you show us a picture of your CPC1100 in the case? I'll get a photo when I get a chance. It's a fabulous fit... about 2" in each direction to allow for rubber foam. The scope lies down in it. Where will you get your foam rubber? 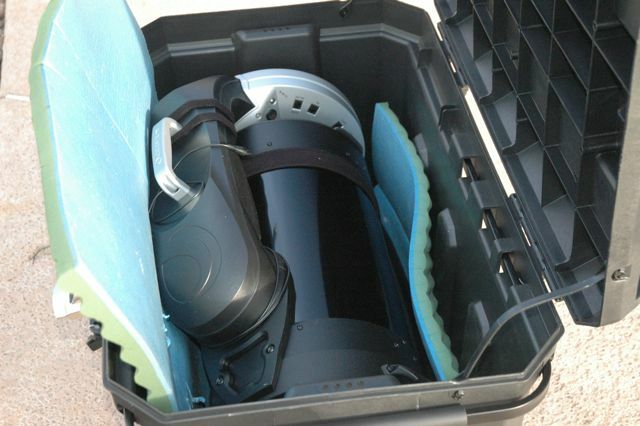 How about the foam the telescope came packed in? I'm going to get it but I think I would use it either for long term storage or for transporting because i leave my CPC11 on the Tripod so I can easily move it when I'm going to observe. With it in the chest it will be harder to take it out because of it being lower to the ground. I bought a case this afternoon and am working with it. Tried Home Depot on line to see if my local store had it, and it did not come up; however, I made an actual visit to the tool section at the store and two cases were there, with a case at $59.97 plus tax. The diagonal and finder scope need to be removed to get the scope in the case. I am experimenting with some old camping bedroll foam and it seems to be working. When the case's handle is extended for pulling, the end closest to you is where I have the focuser/diagonal and is what I call the top. I put the base side of the scope by the wheels and call this the bottom. In this way, when pulling the case, the weight of the scope is at the scope's base and the wheels. Right now when packing I have to raise the scope slightly to get some foam in on the top side (focuser/diagonal side) and some foam just slips in on the bottom (base) side. The handle is very nice as it is metal and extends from its slots on the outside of the case. I'm going back to experiment a little further and will try to post some pictures tomorrow. It looks like a good inexpensive solution. The Stanley Case for the CPC 1100. Took it out Saturday to my club's local star party and it worked like a charm. However, needs two people to get it in and out of an Explorer. Am working on that too. Holy Smoley, it's a CPC 1100! Since these pictures, I've made adjustments to the foam. It's a tight fit but it works. Thanks for the pics Ken. I'm convinced this is the way to go. "However, needs two people to get it in and out of an Explorer. Am working on that too." I think if you can lift it alone, you get to run for governor of California... but I'm not sure! Thanks for the pix, Ken! I picked up one of these this morning. Is there space to get some foam in under the base and at the top? (I'd check with my own CPC11, but it's at Celestron for a GPS repair.) And can anyone suggest what kind of foam to use, and where you can find it? Wow, a $60 case! And thanks to jkf398. What a great first post! Kevin, the foam you see in the last picture is old camping bedroll foam that I have. I use it as a sheet that lines the two sides and the bottom, and then put another piece on the top. A separate piece at each end, and away she goes. With the foam in there, the fit is tight and the scope will not move at all. Don, as I will never be mistaken for the "Governator" I am thinking about some sort of ramp type system for one man operation. However, two people lifting the scope and case is not difficult at all. Hi Guys - It's me again (jkf398, also known as "Kevin"). OK - I told you about your storage solution. Now, here's the foam-rubber solution. Go to So-Fro or Hancock Fabrics (or a similar store) and buy their 2" thick foam rubber; it will be about $20. a piece that's 4' X 2' will wrap nicely around your scope and will enable a tight lid seal. No shocks will intrude and no rattles will annoy! Enjoy. 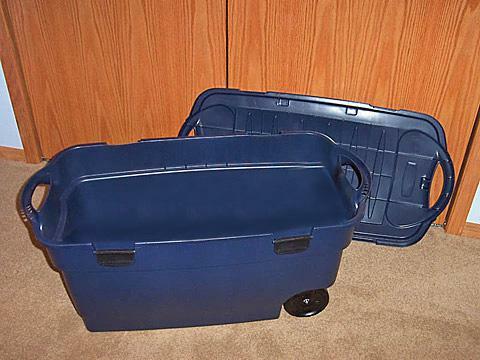 water resistant than the JMI Case as the half-lap lid on the Stanley looks as though water will shed to the outside, on the JMI Case the lid sits in a troff that cannot shed to the outside but rather will leak inwardly. Thanks for the tip- picked it up and found a nice Aluminum box for $25 in the same section that is perfect for eyepieces and accys. I Just recently purchased a CPC 1100 and was looking at JMI cases to store it in but always hesitated because of the price. I will go to Home Depot tomorrow to see if I can pick one of these up. 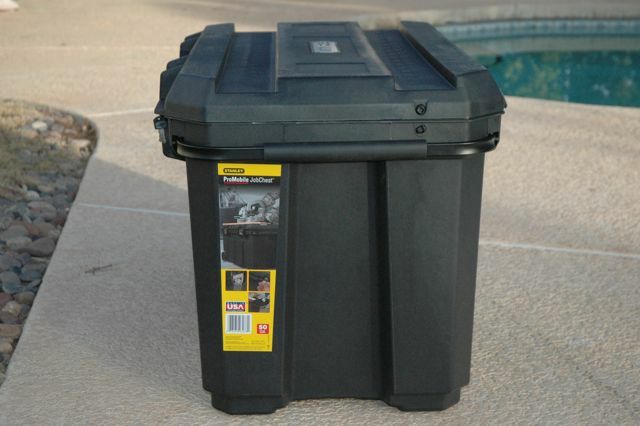 I use a Rubbermaid container to transport my CPC 800. Cost $20 at the local home improvement store. It has wheels and built in handles and I wrap a 'moving blanket' around the scope for protection. The scope fits perfectly. Plus, when not transporting the scope, I store the tripod in it. Yeah, that's a great case. I'm up to three of them! You can see my original case setup for my NexStar 8SE here. My current setup for my CGEM and OTAs is here.